Formerly sleek and dark, with lots of stainless steel, this space now feels like home. While spacious and up-to-date when they moved in three years ago, the kitchen of this Milton Shingle Style home never felt comfortable to the owners. “The cabinetry was dark cherry and the counters were black granite,” says interior designer Beth Bourque. “The whole room just felt very dark and slick; it wasn’t homey.” The owners, who have three children, wanted a light and airy space where the whole family would enjoy spending time. Bourque redesigned the room within the existing layout, and, with help from Masterpiece Woodworks in Avon, had it installed in just two weeks while the family was away on vacation. The space now soothes with pale gray cabinetry, handmade touches, and lighting that brightens the room considerably. The family — including its beloved dog, Daisy — now finds the kitchen wonderfully welcoming and inviting. 1) Counters are made out of honed Turkish marble. “The veining is a warm brown, in contrast to the cool silver tone” found in traditional Italian marble, says Bourque. 2) In the island, Bourque warmed up the aesthetic by adding a farmhouse sink and removing stainless-steel elements, including a trash compactor. Cabinet panels now conceal the dishwasher, and one cabinet slides out for the trash and recycling. 3) Oil-rubbed bronze schoolhouse-style pendant lights are subtle and timeless. 4) Above the newly designated dry bar, Bourque added doors of glass and cerused oak to the cabinets for contrast. 5) The distinctive backsplash above the dry bar is made of Walker Zanger teakwood tile with a weathered gray wash.
6) While cabinet hardware throughout the kitchen is satin nickel, bronze drawer pulls make this wall of cabinets feel like a separate area. “The pulls also tie in with the pendants,” says Bourque. 7) The hood is of rift white oak accented with quarter-sawn oak veneers, all in a cerused finish. “It was important to switch up the finish, because there was so much cabinetry,” says Bourque. 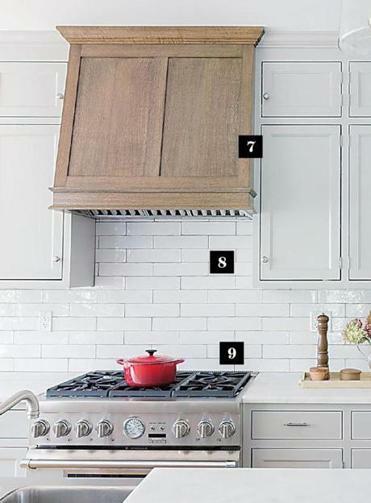 8) The handmade backsplash above the stove is similar in appearance to subway tile but is more linear, with a feathered edge. A dark grout matches the hood and allows the tile’s imperfections to show, adding textural appeal. 9) A new six-burner gas Thermador range replaced a sleek electric cooktop.